"'Jesus answered, Verily, verily, I say unto thee, Except a man be born of water and of the Spirit, he cannot enter into the kingdom of God' (John 3:3-5). "'For by the water ye keep the commandment; by the Spirit ye are justified, and by the blood ye are sanctified' (Moses 6:59-60). "We see here the elements that bring about our second birth or entry into the kingdom of God analogized to the elements that accompany our birth into mortality (water, blood, and spirit). 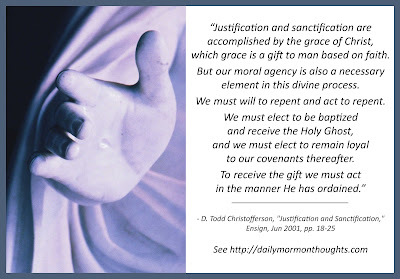 This birth from mortal life into eternal life requires the interaction of (1) covenants (symbolized by water, the principal feature of our first covenant: baptism), (2) the grace of Christ (symbolized by His blood), and (3) the Holy Spirit, the medium through whom atoning grace is applied to remit sins and sanctify souls. "Justification and sanctification are accomplished by the grace of Christ, which grace is a gift to man based on faith. But our moral agency is also a necessary element in this divine process. We must will to repent and act to repent. We must elect to be baptized and receive the Holy Ghost, and we must elect to remain loyal to our covenants thereafter. To receive the gift we must act in the manner He has ordained." 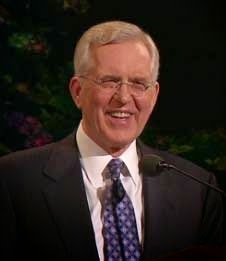 Elder Christofferson's discussion of justification and sanctification in this article is very insightful and helpful to me. In this segment, he talks about the power and blessing of spiritual rebirth that comes to those who choose to accept the call of discipleship and walk steadily on that path. The description from the experience of Father Adam is particularly helpful; I've always been grateful for Adam's audacious questioning of God (but why is this necessary?). This leads to the analysis of the symbols of water (baptism), blood (grace), and spirit (application of the atonement). The power of that grace in our lives in accomplishing God's plan continues to amaze me. How blessed we are to have such a plan of perfect potential, enabling us to use our agency to choose to receive all the blessings our loving Father offers to us, now and eternally!